If there is one noise in India that will ultimately test the patience of even the most battle hardened traveller it is the blast of a horn – or horns as it is rare that you hear just one. Be it on a car, a bus, a lorry, an auto-rickshaw or a motorbike they are omnipresent and all powerful. The horn will make a home for itself in that part of your gray matter that ‘hears’ the sound waves and there it will reside, imprinted onto your aural memory of India with uncanny and awful ease. It is not unlike the Brain Fever bird of the tropical forest whose continual cries can drive a person insane. The main problem lies in the fact that Indians use their horns a lot when on the road, in fact for almost everything. 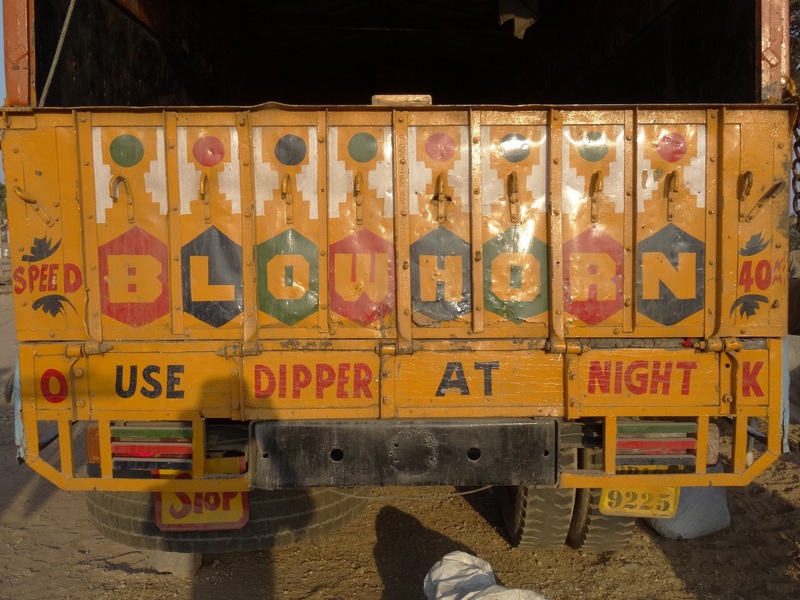 Every lorry has painted on its rear tailgate the ominous words ‘Horn Please’. It is used to let drivers know you are behind them and wish to overtake: to let pedestrians know you are coming up behind them; to warn cows and dogs and any other animal on the road that you are bearing down on them. And the reason that there is so much horn action in India is, ipso facto, because the roads are chock-a-block with traffic, people and animals. In any short drive you will encounter a more varied array of obstacles than in a month in your home country. A cow asleep in the central reservation; a cycle rickshaw laden with schoolchildren; a moped with bottles of gas goose-winging off the sides; a bullock cart heaped with fodder; a troop of whippet-like Langur monkeys; a handcart carrying long steel pipes. Into that mix throw battered buses with people hanging off the sides, lorries, cars, the ubiquitous auto-rickshaws, a swarm of motorbikes, a few bicycles and a lot of people on foot (it is often safer to walk beside the road than on the decrepit pavements and open drains). It is, in a word, chaos. Chaos to the western eye that is because amazingly this maelstrom of movement seems to work in ways that would confound the systems analysts at Microsoft or Air Traffic Control at Heathrow. The first rule appears to be that there are no rules, but that would be misstating the obvious. As far as I can detect the major principle in operation on India’s highways today is that you give way to everything in front of you. Thus, you will see traffic entering major roads from the side without a glance, confident in your letting them do so. Intersections are a constant stop-start interplay as people make their move as and when a gap appears – although there are always a few who do try to force their way through. Turns will often be instigated a long way prior, meaning that some vehicles will end up threading through the oncoming traffic as they make the longest cutting of the corner imaginable. Roundabouts seem to function merely as places for cows and dogs to sit and snooze and there is no real sense of a fixed way to circulate, you just take the most direct route. Overtaking will often occur at what appears to be the wrong moment, the brow of a hill, a bend, in the middle of a busy village or town. Stopping distances are not even a consideration and vehicles will tail gate to within inches of each other. And this is to give just the briefest impression of all the possible manoeuvres that you will witness on the highways and byways of the sub-continent. And all the time the Indian driver sits there, unbelted, chewing his tobacco and talking loudly on his mobile phone. The small temple on the front dashboard is all the protection and assistance he needs out there in the great swirling tide of motion that sweeps around this country like demented corpuscles in some fever ridden body. For a people so in thrall to the concept of family, and especially children, one of the most frightening and surreal sights is that of the family motorbike trip. In the midst of this horn-blasting battle ground will sail a small motorbike driven by the father. In front of him, astride the petrol tank, will sit his youngest son. Behind him will sit his 6-year old daughter, followed by his wife in beautiful sari and at the rear the oldest boy. Five human beings, all immaculately dressed and none wearing helmets. A harmonious and heartwarming sight but also a horrendously vulnerable one. But it does seem to work – up to a point. With margins for error often kept to the bare minimum accidents do occur and in a country with 1.2-billion people that can add up. Over 100,000 people die each year on India’s roads and many more are seriously injured: the animal count is also considerable. Head injuries account for a high percentage due to lack of seatbelt and helmet use. Plus, head injuries often result in chronic debilitation as very often no medical attention is received in the critical first hour after the trauma. If you want to try and get a handle on India just sit and watch the traffic for a while, or better still take a ride with one of these karma confident wheel-slingers. In traffic that would turn the average London cabbie into an effing and blinding heap of distraction they glide through in unruffled ease, barely a flicker of annoyance ever crosses their face. It is Zen driving. Being serene in the midst of the storm. Trusting entirely to their gods, their karma and a not inconsiderable amount of technical expertise. If you ever find yourself considering driving in India my advice would be DON’T! A western mind would disintegrate in minutes out there. This entry was posted in India, travel and tagged cars, chaos, driving, horn, India, indian culture, noise, traffic, travel by Ashby's World. Bookmark the permalink. So true, and same could be said for Cambodia and Laos, and possibly most Asian countries that relied more on peddle and foot power until the last 20 years….but you forgot to mention the omnipresent sound of dogs barking day and night… Loving the blog.